I remember the first time someone in my friend circle got a divorce in their 40s. We had gotten to know each other because our sons became good friends. We each had an “all boy” family and similar pets. I actually didn’t know the family that well, but felt like we did because we had so much in common. One day I called the mom to make arrangements regarding the kids and she told me she and her husband were getting divorced. I was floored. I remember it like it was slow motion. I was at work sitting at my desk and it hit me like a ton of bricks. They looked like the “perfect family”, just like ours. I was shocked. I guess I was naive. Or just in a midlife blur about being in my 40s. This was only the first of several people in my friend circle to get divorced. Once my crowd got a little older, the rate of divorce news picked up too. There was the time that my doorbell rang about 9:00 pm one night. To my surprise, my girlfriend was standing there. It was odd. For some reason, my first thought was that she had breast cancer and was telling friends personally. Wrong. Another divorce. As I aged, so did my friends and family. And it’s no surprise that divorce news started ramping up in my family too. It’s such a reminder that you don’t really know what is going on behind closed doors. And you certainly don’t know what is going on in someone else’s head. What’s happening? Midlife transition stuff? Maybe a midlife crisis? Perhaps empty nest syndrome? Is it simply older and wiser people who just can’t take it anymore? I guess I really shouldn’t be surprised by the causes for divorce. Sometimes I heard that they stuck it out for the sake of the kids. Sometimes they just lost their will to work on a relationship that felt one sided. Some never shared details at all. Also interesting, some no longer had much to do with each other; others have positive relationships where they put the kids first and have been able minimize the drama. Other observations: Usually, when there hasn’t been betrayal, it’s easier to move forward in a positive way. Most are happier now. Most also recognize that it’s super hard on the kids. And all talk about the financial adjustment needed to run two households. Another observation is that men seem to move more quickly into other relationships than women. One really interesting aspect of it all is what I have noticed that I make “divorcing friends” mean to me. -I think it’s scary. You never know the whole story, but clearly, things weren’t as they seemed. And you can’t always work things out. -I think it’s sad. Right away, my thoughts go to the kids. -I’m always surprised, even when I know that things have been difficult. Apparently, I’m an eternal optimist. -I marvel at how much we don’t really know about the people we think we know so well. -I wonder what it would take for me to throw in the towel. Sure, my husband and I have had our fair share of disagreements over the years and some were tricky to sort out, but I’ve never gone to the option of “divorce” in my mind. I’ve always known that, as hard as it is sometimes, we’ll work it out. Our base is strong. I truly want our marriage to work. Clearly, the straw that breaks the camel’s back is different with every couple, in every case and there are some actions that can be unforgivable. I totally get that too. What happens with friendships going forward? I can’t help but think back to some dialogue from my favorite show, Curb Your Enthusiasm. The line is: “We chose Cheryl.” This is what Larry David’s friends told him after they got news that his wife, Cheryl, left him (in the show). I, too, have found myself making a choice to have a closer friendship with one friend or the other. I find it hard to do otherwise without feeling like I’m betraying a friendship. So I guess I don’t have any answers, just midlife observations. 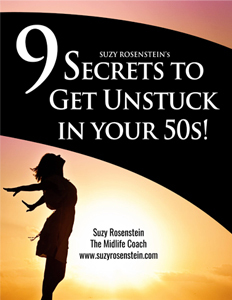 The midlife chapter sure is a huge transition, filled with lots of difficult things. Sometimes dealing with the trials and tribulations of life casts a spotlight on relationships that just can’t be ignored. Divorce is something that comes up in my life coaching practice, for sure. Just like everything else we talk about, one of the first steps is to separate the facts from the thoughts. The facts themselves are neutral. It’s what we think about the facts that causes the problems in our lives. And the great news is that we have control over what we think. This process of getting perspective on your mind is so helpful. It’s also another life transition that is a perfect time to get dreaming again! Download the free Dream Igniter and learn 10 great ways to help you get started. Following your dreams and expanding your mind to what’s possible is something that is good for everyone. We only live once, afterall. Contact me at www.suzyrosenstein.com to learn more.